Hello friends in One Artsy Mama land! In Maryland, we’re enjoying a beautiful start to our fall, complete with cooler air, changing leaves, falling acorns, and of course, SQUIRRELS! These little guys are all over our yard (as I’m sure many of you are experiencing), and I thought it could be fun to incorporate some squirrel activities in our preschool adventures. I came up with this fun craft that doubles as a toy, and I can’t wait to show you how we did it! 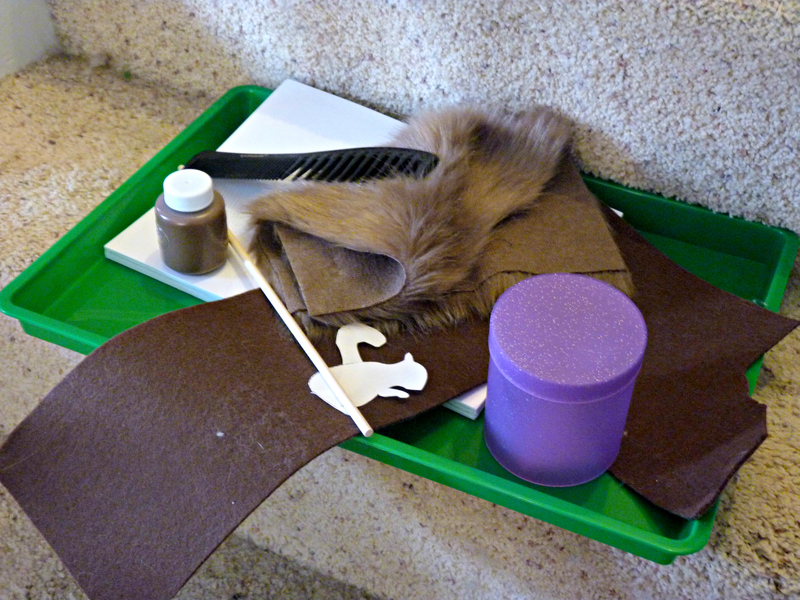 Steps 1-3: Trace and Cut Squirrel Parts (stiff felt for the body, fur for the tail). Color dowel brown with marker or paint (you can leave the ends, one will be covered with a squirrel, the other will be trimmed). Assemble everything with hot glue. It’s like a squirrel sandwich! BODY, TAIL, TAIL, DOWEL, BODY. I added a nut at the end, because I wanted to make it even cuter. And the squirrel looked hungry. FEED THE SQUIRREL. Step 3a. Bam Bam’s step. Add Googly Eyes. Ok great, so now we have a squirrel! But winter’s coming (at some point, like in 4 months, but stay with me here), and we need to make the squirrel a home! Time to do some texture painting with Bam Bam! I adapted the idea from HERE. We grabbed our materials (paint, comb, and cardstock) and away we went! Steps 1-3: Squirt paint on paper. Use the comb (We did an “up/down” technique. I also used a lot of paint because I wanted it to look “full”) to paint. Let Dry. Steps 4-6: Once dry, cut a strip to go around the container and glue. Cut a circle to fit on the container lid and glue. While you’re at it, cut some felt to go around the edge of the lid, and glue that too. Steps 7 and 8: Cut a piece of felt (the softer felt) to fit inside to make his home cozy (no glue needed). Punch a hole the size of the dowel in the bottom of the container. Now we have a nice cozy squirrel home for our squirrel to hang out in! It was time to try out the squirrel in his new home and make the puppet come alive! I even taught Bam Bam a squirrel song complete with shaking one’s bottom (tail). He looked at me like a 15 year old girl looks at her Dad who’s trying to hang out on prom night. Yeah. …when i heard a noise. Kinda like a chittering, rustling, scrambling, clawing noise. I looked quickly to my left…. So there we have it, the cutest little peek-a-boo squirrel puppet to play with this fall. The texture painting added such a great vibe to the trunk, and I love the bushy squirrel tail. Fair warning though, if you make this craft, you might have a #squirrelstalker too ;). I love this craft and hope to make it on 10/31 with my daughter’s first grade class. I would love to use the template that you did for the squirrel! Could you post the link for me? I think I must have missed it somewhere up top sorry!